Home ADMISSIONS AP ADMISSIONS AP CETs AP PGECT AP State APPGECET APSCHE CETs ENTRANCE TESTS NOTIFICATIONS AP PGECET 2019 notification, Schedule, Apply Online ..
AP PGECET 2019 notification, Schedule, Apply Online ..
AP PGECET 2019 Online Application Form, AP PGECET 2019 notification, Schedule, Apply Online from March 21: Andra Pradesh , APSCHE will issue Post-graduate Engineering Common Entrance Test (PGECET) 2019 in March 2019. 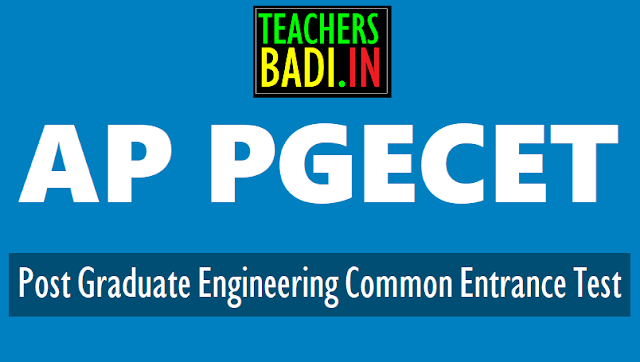 PGECET is a State level common entrance test. It will be conducted by the University College of Engineering, JNTUK on behalf of AP State council of higher education, a statutory body of Government of AP, Hyderabad. AP PGECET 2019 notification schedule, Online Application Form, Eligibility, Registration Fee, How to Apply, Instructions to Candidates, Last date, Hall Tickets, Entrance Exam Date, Key, Rank Cards, Results and Web Counseling Dates will be provided soon. The University invites online application for appearing Post-graduate Engineering Common Entrance Test (PGECET) for admission into M.E / M.Tech. / M.Pharm. / M. Arch. / Graduate level Pharm. D (P.B.) (Full Time) in University and Affiliated Engineering / Pharmacy Colleges in A.P. for the academic year 2019-2020 as per G.O.Ms.No.54 HE Dept (EC-2) dated: 21-06-2007 and amendments. Eligible candidates who wish to apply for PGECET 2019 may submit their applications through online mode only including the payment of registration fee and generation of Hall Tickets. Candidates can visit the websites www.jntuk.edu.in, www,appgecet.org. for submission of online application. The related information regarding eligibility, syllabus, instructions and procedure for online application are available on the website: www.appgecet.org. Registration fee: Rs.1000/- ( Rs.600/- in case of SC / ST candidates). In case a student wants to appear for more than one test, separate registration fee has to be paid for each test. 1. Candidates are required to apply for APPGECET 2019 test through Online only (printed hardcopy of the applications will not be accepted). 2. The application/ registration fee for the test is Rs. 500/- (Rs 250/- in case of SC/ST). In case a candidate wants to appear for more than one test, separate registration fee has to be paid for each test. 3. Test is of two hour duration with 120 multiple choice objective type questions, carrying one mark for each question. The cut-off mark in the Common Entrance Test is 25%, in case of SC/ST there is no minimum marks. 4. The examination will be held from 10.00 AM to 12.00 Noon in the morning session and 2.00 PM to 4.00 PM for the afternoon sessions as per the Time Table given in Test Schedule. 6. Candidates must ensure themselves that they have chosen the correct test paper, which qualifies them to become eligible to seek admission to the specific program they are interested in. The details of the courses offered by the Universities along with specified eligibility for each course and test to be written is given at annexure-B. Candidates should ensure that they satisfy the eligibility criteria for admission into the preferred program as given in annexure-B. 7. APPGECET-2015 will be held at Five different regional centers in the state i.e., Visakhapatnam, Kakinada, Guntur, Tirupathi, Anantapuram. 50% in the qualifying examination (45% for reserved category). Further, the qualifying degree (Professional courses) obtained under distance mode must have AICTE approval. 9. Candidate should satisfy local/non local status requirements as per AP GO Ms No 153. 10. The Hall-Tickets are to be downloaded from the website www.appgecet.org. Without Hall-Tickets the candidate will not be allowed into the test centre. 11. Separate Notification will be issued for admission based on GATE/GPAT Score. 12. A.P. State policy on reservation shall be followed in the PG admissions. 13. The candidate can apply for multiple tests. However, separate registration fee must be paid for each test. 14. Appearing in the test does not guarantee admission. The candidate has to satisfy all the requirements at the time of admission.